"Somewhere in your fostered being you have given God your answer. And your life has turned to the direction of that thrilling-yes… or that shattering-no." 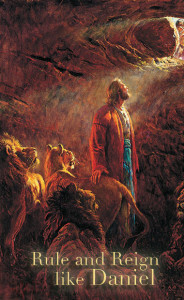 Daniel endured always above the fray. So he held and wielded enormous power on the earth. He lived in the view of God as Ruler: absolute, unchallenged. And because Daniel believed it, he brought Heaven’s Rule into the earthly government that thought it could unseat Heaven. Blessed be the name of God forever and ever, to whom belong wisdom and might. He changes times and seasons; He removes kings and sets up kings; He gives wisdom to the wise and knowledge to those who have understanding; He reveals deep and hidden things; He knows what is in the darkness, and the light dwells with Him.